So I have been slow to jump on the whole baconbaconbacon bandwagon. I mean, I like bacon. I love bacon. But I’m not one to get bacon ice cream a maple bacon doughnut or chocolate covered bacon or get chocolate bars with bacon in it. I do, however, love maple bacon. Not in stuff–I accidentally put maple bacon in a quiche once and it was kind of horrific. But with stuff? Or by itself? Yes, please. 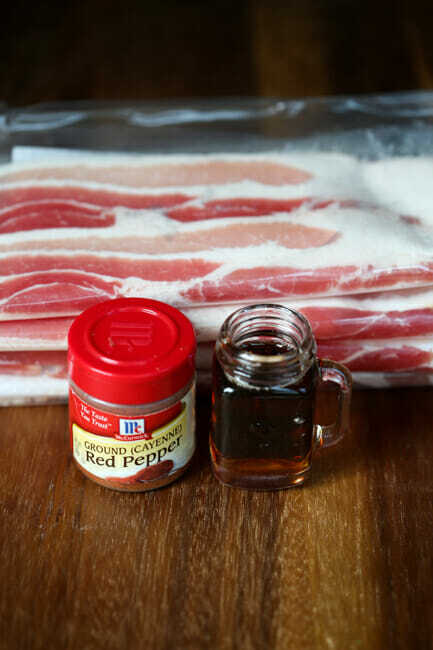 You’re going to need 12 ounces of smoked bacon (I’m just using regular ol’ non-special bacon, but this would be extra amazing with those thick-cut specialty bacons), a few tablespoons of real maple syrup (leave Mrs. Butterworth on the shelf this time and splurge for the good stuff), and a bit of cayenne pepper. Preheat oven to 400. Line a rimmed baking sheet with heavy-duty aluminum foil. 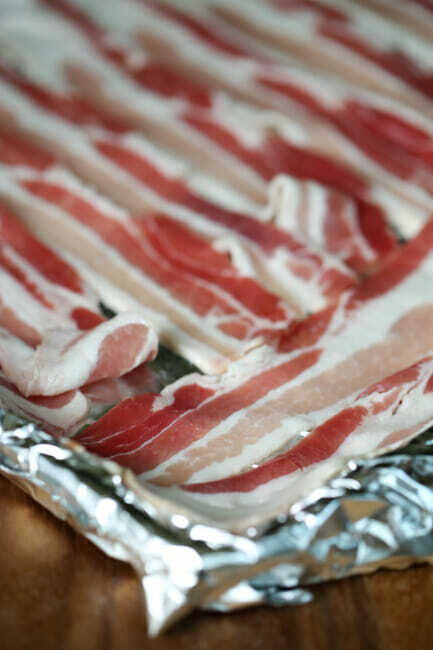 Place the bacon in a single layer over the foil and set aside. Whisk together 2 tablespoons syrup and cayenne pepper. Using a pastry brush, brush it over the bacon. Bake in the oven for 18-22 minutes or until crisp (be sure to watch it at the end–the syrup on the bacon will burn in a really short period of time!) Remove the pan from the oven and then use tongs to transfer the bacon to a paper towel-lined plate. Brush with remaining 1 tablespoon of syrup. This bacon is just as good at room temperature as it is hot. Serve it with breakfast or brunch. Or by itself. I won’t tell anyone, I promise. Whisk together 2 tablespoons syrup and cayenne pepper. Using a pastry brush, brush it over the bacon. Bake in the oven for 18-22 minutes or until crisp (be sure to watch it at the end–the syrup on the bacon will burn in a really short period of time!) Remove the pan from the oven and then use tongs to transfer the bacon to a paper towel-lined plate. If desired, brush with remaining 1 tablespoon of syrup. This bacon is just as good at room temperature as it is hot. 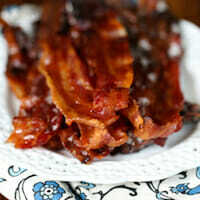 Oh my gosh, I looooove maple bacon! I can’t wait to try it out this weekend! I’ve been baking my bacon ever since you guys showed me how to do it here and it was kind of life-changing. This just makes it even better, lol! Where did you get that adorable little mason jar?? How big is it?! Oh my goodness, I could eat this like candy! I love bacon and I love maple donuts. But bacon maple donuts are just not good! This looks like a great addition to bacon without trying to cram two delicious things together and making them a really bad for you undelicious thing. You get me. While I am sure that real maple syrup is best, could you please make it clear why pancake syrup or even home made maple syrup (I make my own with maple extract, brown sugar, corn syrup, etc.) would not work well? I ask this because real maple syrup is among the highest price grocery items these days and I never buy it. In all honesty, although it might have a more complex or cleaner flavor, I really don’t notice that much difference between the real thing and my own homemade (and much less expensive) version and I have used it in many applications calling for real maple syrup where it seems to come out fine. Thanks! What rack would you suggest putting it on in the oven? Also, does it spit all over the place so I would need to put something on top of it? Sounds yummy! I also make homemade syrup, but with the maple extract, sugar and water. While it’s certainly not as thick as the grocery store kind, the flavor is so much better (I also admit that I actually don’t like “real” maple syrup. weird, I know.) I, too was wondering if you could use “fake” maple syrup for this. Will try it out tomorrow and post again with results. Thanks for the great idea! Someone once recommended to me to put my bacon on a cooling rack and then on a foil or parchment lined cookie sheet, and the fat of the bacon drips away from the bacon, which is great because I think it gets a bit crisper. 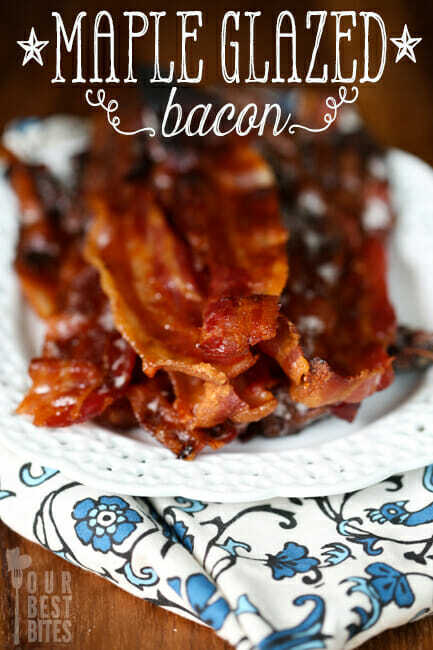 I love baking my bacon- it’s so easy and it keeps it flat. Love your cookbooks and your site- you guys are pretty awesome. My mom made this for everyone over Conference weekend, and we were all in bacon heaven. You are a saint for posting this. *No terrible pun intended.